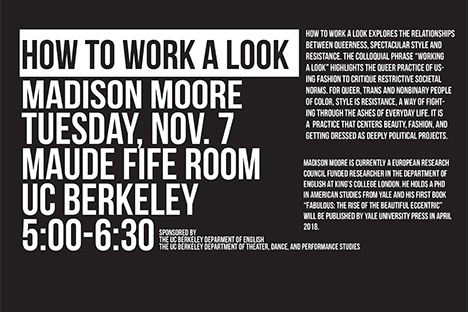 How to Work a Look explores the relationships between queerness, spectacular style and resistance. The colloquial phrase working a look highlights the queer practice of using fashion to critique restrictive societal norms. For queer, trans and nonbinary people of color, style is resistance, a way of fighting through the ashes of everyday life. It is a practice that centers beauty, fashion, and getting dressed as deeply political projects. Madison Moore is currently a European research council funded researcher in the Department of English at Kings College London. he holds a PhD in american studies from Yale and his first book Fabulous: the Rise of the Beautiful Eccentric will be published by Yale University Press in April 2018.